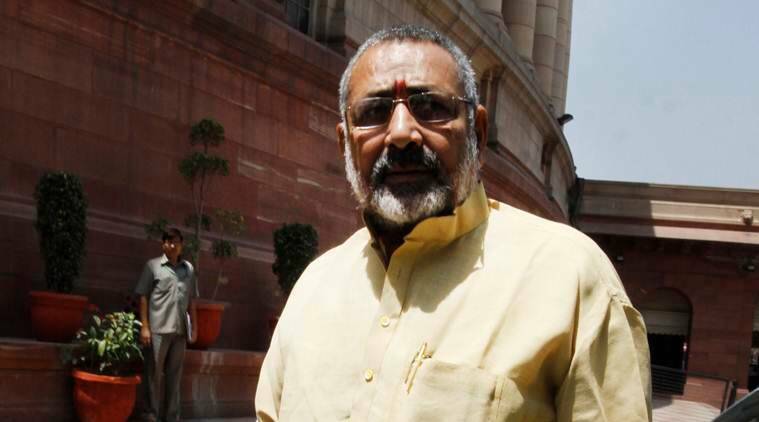 2019 Lok Sabha elections: One of Hindutva’s poster boys, Giriraj Singh is more upset with his own party because ally LJP, which has been given the Nawada seat as part of the NDA seat-sharing arrangement, was ready to leave the seat for him. One of the first leaders who in 2013 publicly called for Narendra Modi as the BJP’s prime ministerial candidate, he went on to become one of the most vocal ministers in his government, remembered best for attacking critics with his ‘send them to Pakistan’ remarks. But three days after the party named him as its candidate for the Begusarai Lok Sabha seat, Giriraj Singh is still in New Delhi, miffed and still to make up his mind on contesting the seat. He points to his “honour”, disappointed and annoyed that the party did not consult him before taking away his Nawada seat and packing him off to Begusarai. “It has come as a big jolt that Giriraj send-them-to-Pak Singh sulks over Bihar seat change: Done in by my own party state BJP leadership, which has not displaced any sitting MP in Bihar, did not even ask me (before changing his seat). My self-respect has been hurt. I have nothing against the (BJP) central leadership. The jolt to my honour and hurt to my self-respect has been inflicted by the state leadership,” Singh told The Indian Express. Singh said he does not know why his Nawada seat — which he successfully contested in 2014 — was taken away from him. He said he had been keen on Begusarai for more than two decades, but had to give it up because Nitish Kumar, now Chief Minister Nitish Kumar, wanted it for Pandit Shyam Nandan Mishra in 1996, and in 2014 he was told to go to Nawada by Bhola Singh who went on to become Begusarai MP — Bhola Singh passed away last year. One of Hindutva’s poster boys, Giriraj Singh is more upset with his own party because ally LJP, which has been given the Nawada seat as part of the NDA seat-sharing arrangement, was ready to leave the seat for him. “Chirag Paswan told me on phone that his party would be ready to leave the (Nawada) seat for me. The BJP state chief also said that I can fight from the seat I want. Chirag Paswan even said I wanted to give it to you, but what can I do if the NDA puts it in my lap. That’s why I am hurt,” he said. Singh has reasons to be worried. He represents the Bhumihar community which accounts for 3-4 per cent of the state population. The community, which votes in strength for the BJP, plays a key role in deciding fortunes in a few constituencies like Nawada, Begusarai and Jehanabad. Bhola Singh had won Begusarai with a 58,000 margin. But this time, the CPI, which secured 1.9 lakh votes in Begusarai in 2014, has fielded Kanhaiya Kumar, another Bhumihar. The constituency also has a sizeable Muslim vote and it is unlikely that Muslims will vote for Singh given his utterances targeting the community. Singh’s aides fear that a split in Bhumihar votes and Muslim anger in Begusarai could cost him the seat. Singh has never been on very good terms with Nitish Kumar. He was a minister in the Kumar-led JD(U)-BJP coalition government, but he unabashedly spoke of his admiration for Narendra Modi and publicly lauded the BJP’s break-up with JD(U) in 2013. Singh and BJP Bihar leader Sushil Kumar Modi too are not on the best of terms. But Singh has had his way given that he has the backing of both Amit Shah and Prime Minister Modi. Earlier this month, when Modi addressed a public rally in Gandhi Maidan in Patna, Singh was not on the dais and this fuelled speculation that he was kept out at the behest of the JD(U). Singh said this was not true, and that he was unwell then. “Would anyone dare not to give me a chair on the dais where Modiji is present?” he asked.